That was going to be “It’s the writing, stupid!” Not that any of us is stupid! But, when we see a film, how much thought do we give to the writers? I finally want to rave quietly about the recent Jungle Book. There was so much about that film that was excellent! Many people have pointed out many of these things: the excellent animation, the child’s performance (which, okay, had its rough spots, but which was generally completely natural and believable), the voice cast, the music, the pacing, and so on. Only a few people that I know of mentioned the writing. And it is the script all these other things depend on. You could have fine actors, excellent animators, good musicians, excellent sets and camera work and so on. Yet, without a solid story, you could still have a bad movie. Now, I’m of the generation that remembers the “original” animated Jungle Book. And I’ll tell you something. When I saw it as a small girl, I liked it. I even liked it a lot. I didn’t love it, and that’s because I knew and loved the book. The cartoon simply wasn’t anything like the book. The new movie does justice to the book, as well as the cartoon. For the new movie has three sources. They are (1) the Disney cartoon. I don’t honestly remember it well enough to say how good an adaptation of the cartoon this new movie is, but others, who remember it better, proclaim this adaptation is very good and faithful. (2) the stories Kipling wrote. I loved how Kipling’s actual text was used in the film – more on that below. (3) Finally, there is real science; the actual natural history of Asia. The filmmakers, including the writer, succeed in melding these three things into a classic coming-of-age tale. 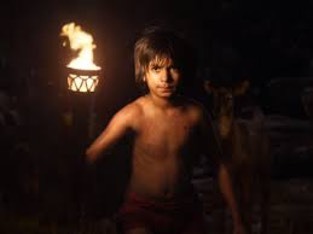 Mowgli, as played by Neel Sethi, is a more likeable child than the original Mowgli. Outspoken, observant, and determined, he also has a kind heart and an instinct for generosity. During the course of the film, he causes harm—quite grievous harm in one case—but also strives to help and heal. I loved this. I also loved the way the film extrapolates from a couple of Kipling’s sentences. Kipling remarks that the jungle feared Mowgli for his cleverness, and also that, as a woodcutter’s child, he had an instinct to build and used to make little shelters and the like. The film lets us see him doing this. It also shows the little boy thinking through problems and creating tools—ropes, hand axes, and the like--that allow him to achieve his goals. The wolves don’t approve of these tricks, and order him not to use them, but Mowgli can’t help himself. He is creative at the core of his being. But, if humans are creative, they are also destructive. The symbol for the destructive nature of humanity, in both book and film, is fire—the red flower. In both book and film, Mowgli goes to the man village to get some and use it as a weapon against the tiger, Shere Khan. The scenes that include fire—both animated and live-action—are beautiful and emotionally resonant. Some of the language of the film is beautiful and resonant, too. We get to hear the first part of the poem, “The Law of the Jungle”. When I was watching, I thought how wonderful it would be for children in the audience to hear those words for the first time. Also Raksha, the mother wolf’s, “The cub is mine, mine to me!” These things, of course, come straight from the stories by Kipling. Here are some other thoughtful and deliberate tributes to the book. 1. The buffalo stampede, and Mowgli’s riding of a buffalo. In the book, of course, this is how the boy kills the tiger. There are echoes of Indian myth in this, but I actually preferred the way the boy used his human skills in the final movie battle. His escape with the help of the buffalo was thrilling, visually stunning and a worthy tribute to Kipling’s text. 2. Shere Khan’s suborning of the young wolves. Again, in this new movie, we actually get to see and hear this. We see Rashka’s fear and worry when the tiger corrals her cubs and tries to turn them against their foster brother. And we hear the silky-voice tiger tell the story of the cuckoo, and how it destroys its foster mother’s young. This is so very well written! It’s a wonderful extension of Kipling. 3. Chil the kite! My sister was delighted to see him carry Mowgli’s warning, just as he does in the book. 4. The Bandar-log. Though this scene owes more to the earlier cartoon than to the book, it is as scary as it ought to be. There are also echoes of later Jungle Book stories, such as “the King’s Ankus”, in the shots of the ruined temple and the statues of men doing violence to men. Here is is the visuals, as much as the words, that refer back to the original text. 5. The peace rock. I did not imagine the rock looking this way, but the drought, and the peace rock itself, are straight out of Kipling’s tales. 6. The elephants. Stephen Greydanus has written about what they signify in Indian myth, in Kipling, and in the new movie. I agree; it’s wonderful to see spirituality, pagan or otherwise, addressed with subtlety and grace in a children’s film. And it’s wonderful to see the elephants treated with the dignity they deserve, and which they have in the original stories. Almost all of the species shown in the film really do live in or around Pench national park, in the Sioni hills in India. Based on what we now know of wolf biology, it makes great sense that Raksha is the alpha female. Normally, it’s only the alpha male and female in a wolf pack that have cubs. So it also makes great sense that Akela and father wolf are one and the same. They weren’t in Kipling’s stories. I appreciated the correct biology in the movie! It also makes for a stronger conflict when Akela’s life is threatened. This happens in the book, too, but in the movie, Akela isn’t only Mowgli’s protector and guide; he’s his foster father. And a final point on the biology. I remember reading an article in the National Geographic called “The Honey Hunters of Nepal”. 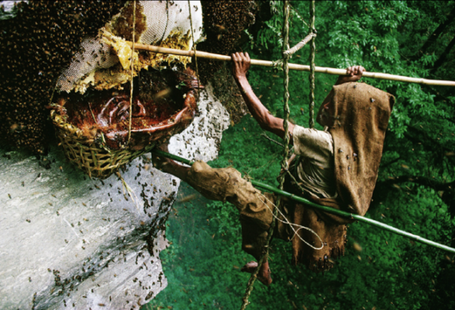 These people got honey from bees nests in cliffs using methods like those Mowgli devises in the movie. So this is a film with a great cast, wonderful visuals, good research, respect for its sources – and, above all, in putting all these things into an emotional and well-paced story, excellent writing. Anyone who has ever loved either the old Disney cartoon or Kipling’s book should see it.